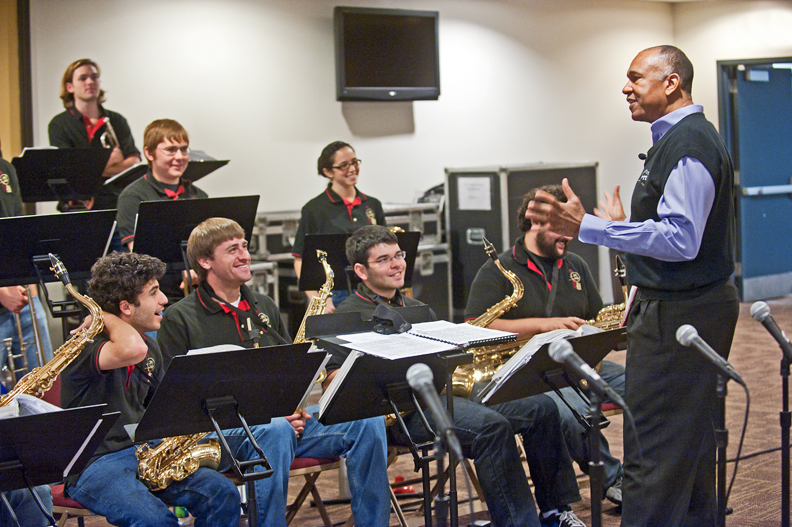 On October 26, bassist and Grammy-winning jazz composer John Clayton (standing) led a master class in the Shea Room with BC bOp!, the University’s jazz ensemble of 17 instrumentalists and eight vocalists. Since 2000, the band has made eight appearances at the Lionel Hampton International Jazz Festival in Moscow, Idaho, which Clayton directs. Shown are band members (front row, from left) Kyle Marra ’12, Patrick Andrea ’13, John Schettino ’15, Joe Caracappa ’13; (middle row) Josh King ’12, Katherine Giffune ’12; and (back row) Tim Leccese ’12. The ensemble is under the direction of Sebastian Bonaiuto. This feature was posted on Thursday, November 17, 2011 and is filed under Featured Photo.